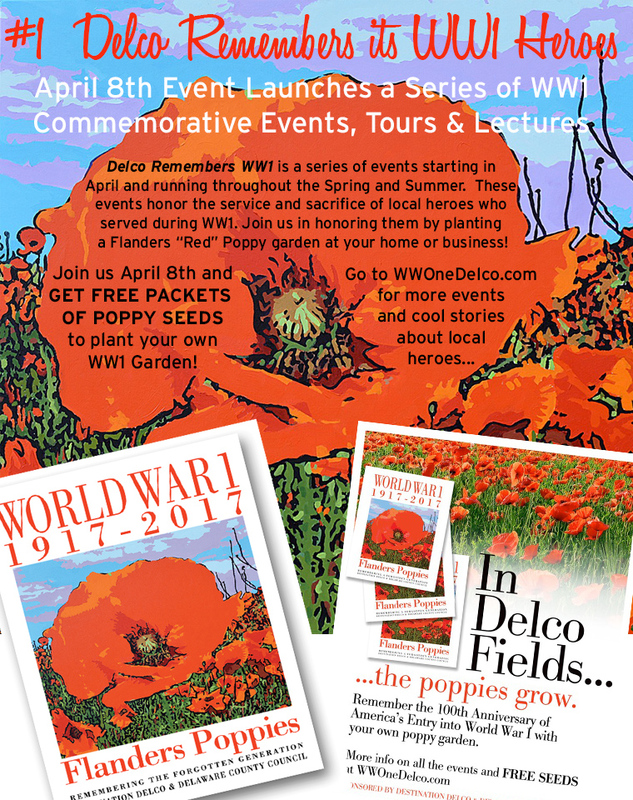 Delco is Painting the County “Red” with Poppies -- and we want you to join us! 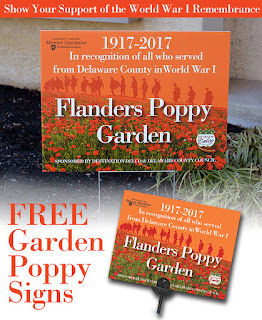 Every resident, business, garden and park in Delaware County is invited to join local historians, veterans, the Tourism Bureau and Delaware County Council in this special Poppy Planting to commemorate the Centennial of World War I.
recognized memorial symbols for soldiers who have died in conflict. 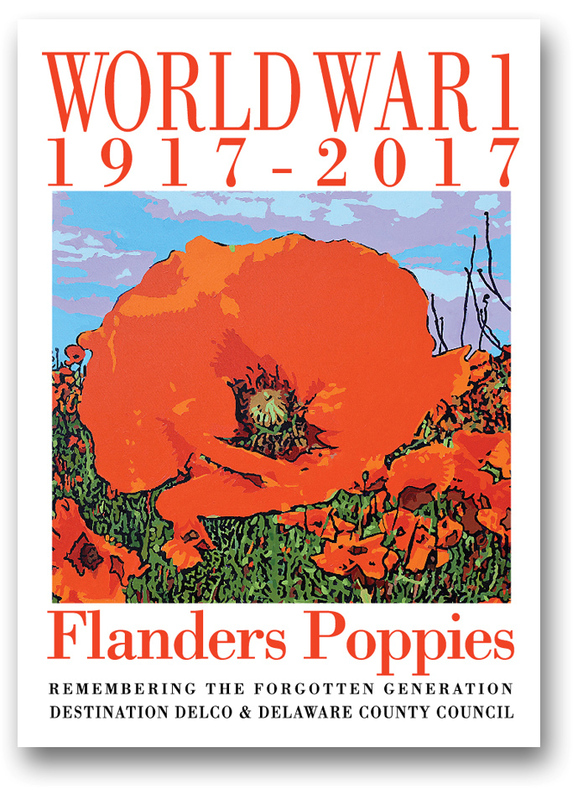 A member of Delaware County Council will read a Proclamation of Remembrance honoring the local men and women who served and sacrificed during WW1. 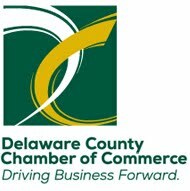 In addition to moving ceremonies, the event will recognize the outstanding efforts of the World War One Delco Centennial Committee, led by Barbara and Anthony Selletti. All Attendees will get free Poppy Seed Packets for planting commemorative gardens of their own - plus a sign for showcasing the seed packet in your garden! 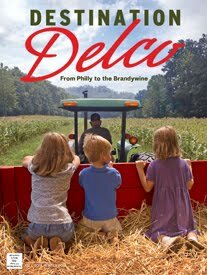 Barbara & Anthony Selletti - speak about the mission, the events planned, and the war efforts of Delco WW1 patriots. 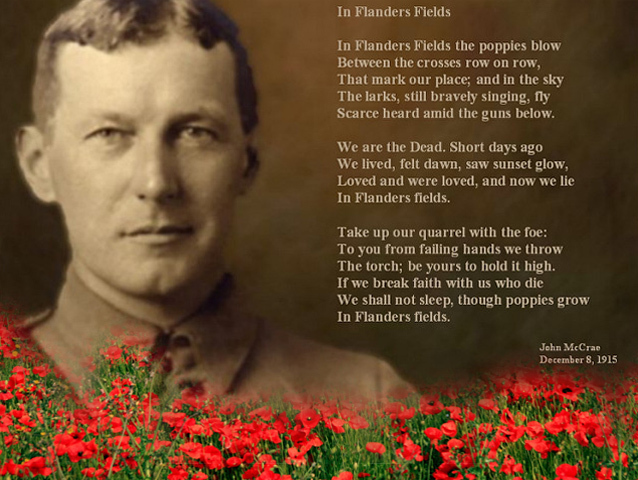 April 8th is a FREE premier of the documentary “Memories of the Great War” produced by Barbara and Anthony Selletti at the Vinyl Revival Screening Room of the historic Lansdowne Theater. There are two public showings at 12:45 p.m. and 1:45 p.m.
Also on April 8th is a ceremony at the Chester Rural Cemetery honoring those who died in the Eddystone Munitions disaster of 1917. 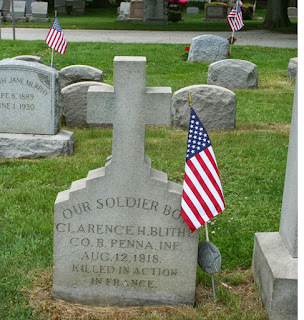 In this cemetery you will also find the grave stone of Charles Blithe (pictured below), killed while serving in France during World War I.
APRIL 20th through MAY 25th: This is the ideal time to plant your Red Poppy Gardens! Get your free seeds at the Tourism Bureau office in Rose Tree Park or at dozens of other locations listed on the website. You can also get a FREE SEED PACKET SIGN POST to put up next to your garden. Call 610-565-3679. 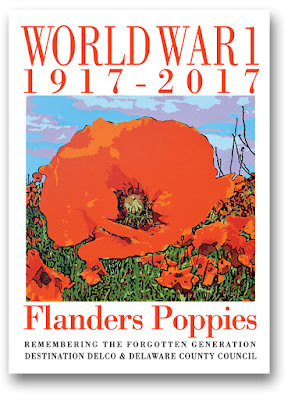 April 30th, at 2:00 p.m. -- the new Rose Valley Museum at the Thunderbird Lodge will be hosting a lecture on World War One in the Golden Age of Illustration. 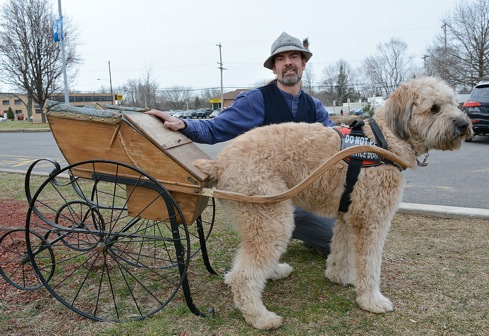 his ancestors pulled medical and supply carts to soldiers on the battlefield in WW1. Plus don't miss the story on the role of Military Dogs in WW1 - including a profile on Sgt. Stubby...an American dog who became the most decorated canine soldier in the war! And learn more about Penn State Extension Master Gardeners of Delaware County...their support, expertise and enthusiasm has been invaluable in developing our County-wide Poppy Planting program. What's not to love about great food at special 'try me' prices? The best part is you can roll from one Restaurant Week into the other! 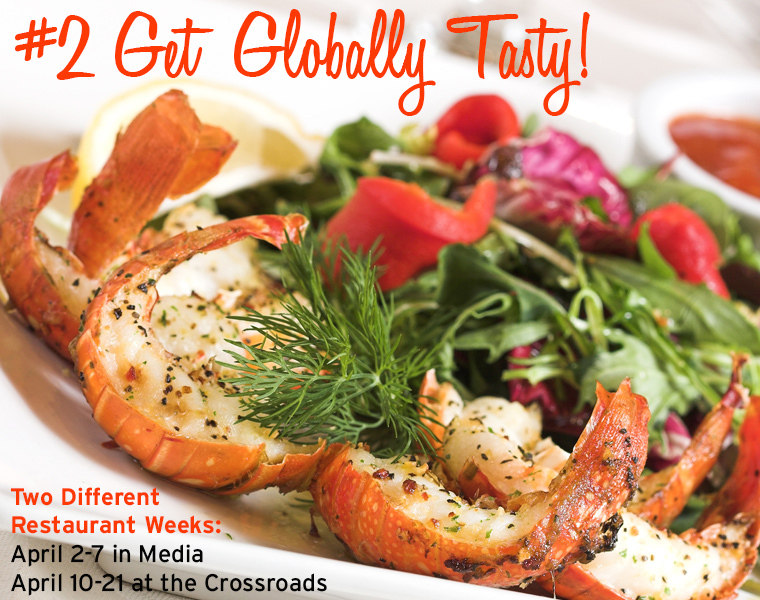 From April 2nd through the 7th, sixteen Media restaurants will offer dinner specials for $25, $35 or $45 dollars. 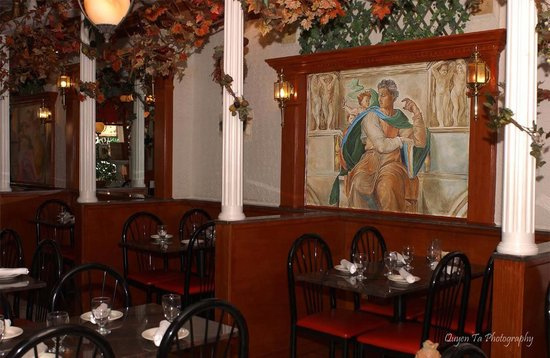 Other discounts are available, just check with your restaurant of choice. 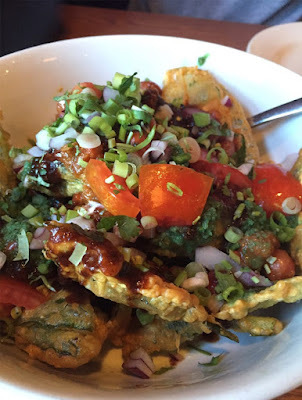 320 Market Café - 211 W. State St.
Ariano - 114 S Olive St.
Fellini Café - 106 West State St.
HOUSE restaurant - 110-114 South Jackson St.
Margaret Kuo’s Media - 4-6 W. State St.
Shere-E-Punjab - 208 W. State St.
Spasso Italian Grill - 1 W. State St.
Tagine - 111 W State St.
Tom’s Dim Sum - 13 E State St.
Several towns spanning Delco's Crossroads participate every April in International Restaurant Days, a celebration of diversity through food. If you haven't stepped outside your regular haunts lately, consider one of these globally tasty places. The Painted Tea Cup - Upper Darby – Not Valid Sat. 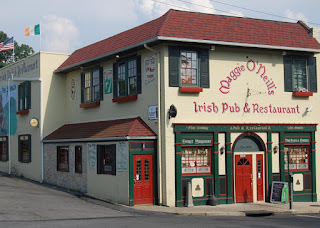 For a brochure listing all International Restaurant Day locations and addresses call 610-259-7016. 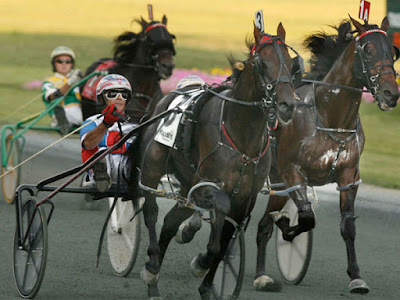 Harrah’s Philadelphia Racetrack is among the very best places for harness racing during the year, boasting one of the fastest 5/8 mile horse racing surfaces anywhere with its first-of-its-kind in North America miracle turn that actually extends over the Delaware River with a specially constructed bridge. Don't miss any of the action! Post Time is 12:40 so bring family and friends to see some of the best pacers and trotters in North America compete for the first time this year! 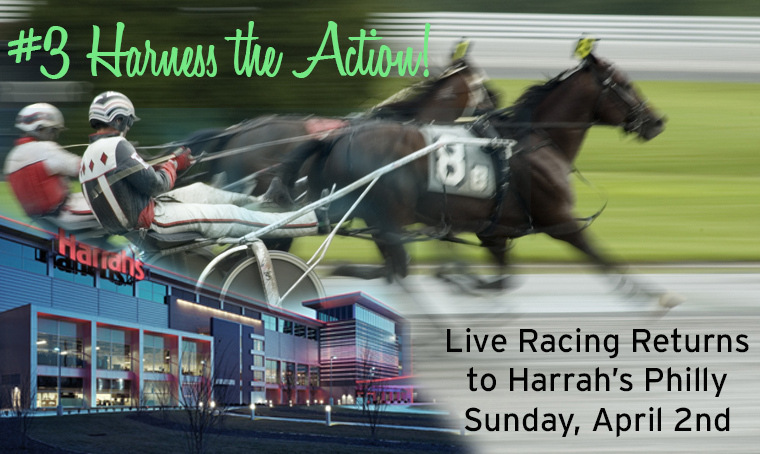 Harrah’s also offers full-card Philadelphia simulcasting of both thoroughbred and standard bred signals, seven days a week and provides a state-of-the-art indoor wagering area with plenty of seating and simulcast video options. Wagering on live horse races is available on-track from April to December on Sunday, Wednesday, Thursday, and Friday. The racing broadcast is also available for wagering via simulcast from other racetracks throughout the United States and Canada. Your woolly welcome will be a warm one as the Plantation sheds its winter coat (check out their Sheep Shearing weekend below!) and replaces it with green grass, planted fields and all types of farm animal fun. This historic gem is a living history salute to the early American farmer families who brought the land to life while epic political challenges swirled around them. 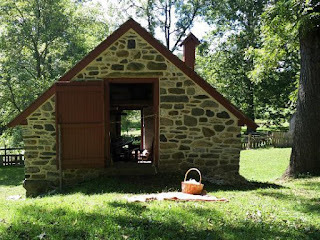 The food grown at these early plantations fed the birthing of a new nation...and seeing how they lived will make the 1760-90 period come alive for you and your family! 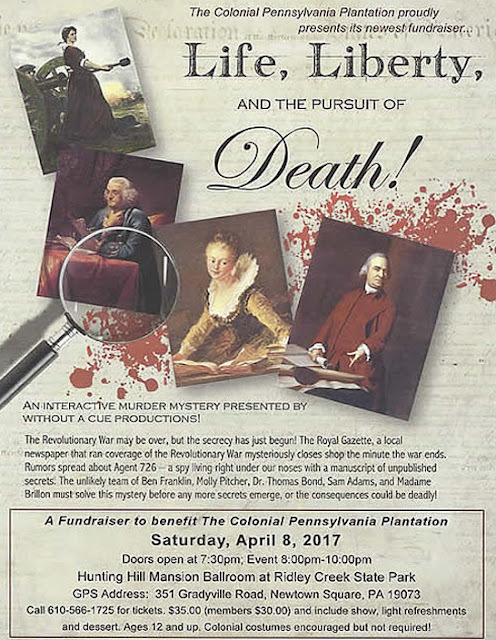 My dad loved history...in books,on film, and was a heck of a storyteller himself ;) And he would have loved joining Ben Franklin, Molly Pitcher, Sam Adams and others to find a Revolutionary spy before something dastardly happens! Starts at 7:30. Tickets $35. You won't need a time machine to travel through 300 years of American History. come and interact with some 17th Century settlers, then experience the American Revolution, the Civil War, World War 1 and World War II, with Professional reenactors recreating these memorable times. Admission is $10.00 for adults and $6.00 for children ages 4 to 12. Cut, cuddly...and a crucial part of life on the Plantation. Learn all types of interesting things about them at this day devoted to Ewes (mommy sheep), lambs (baby sheep) and rams (big-daddy sheep). April 29th - Sheep Shearing. 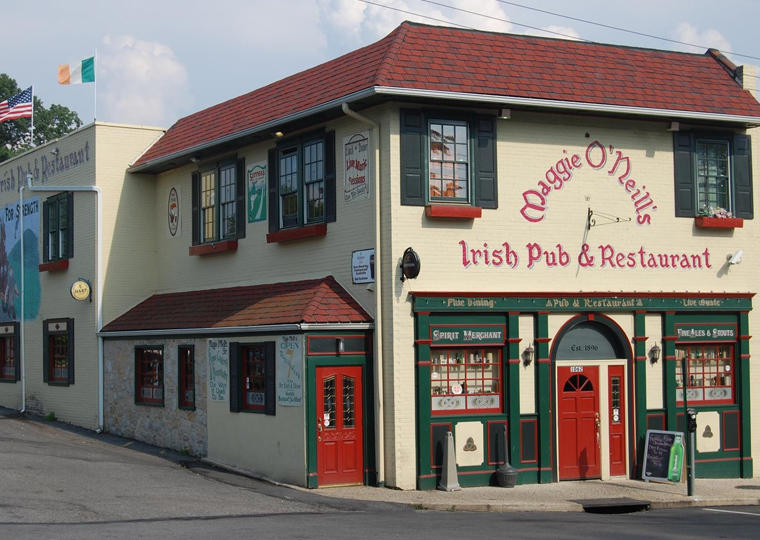 351 Gradyville Rd., Newtown Square. On April 8th Charlie will be one of 23 acts performing in restaurants all over Media. 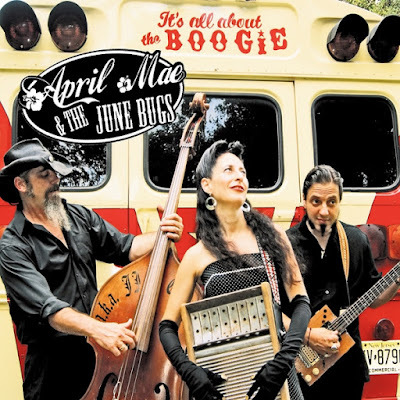 There will be more foot-stompin' fun on State Street than in any California Vineyard grape barrel! The sidewalks will be thrumming to American Roots Music from early Rock & Roll to Rockabilly, Classic Rhythm & Blues, Bluegrass, Folk and Zydeco. Rock & Roll Hall of Fame in 1998. 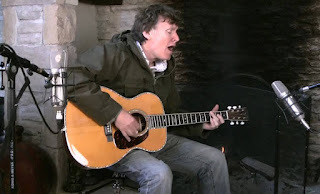 On Saturday, April 22nd Steve Winwood with Special Guest, daughter Lilly Winwood will rock the Tower with a one night only performance. 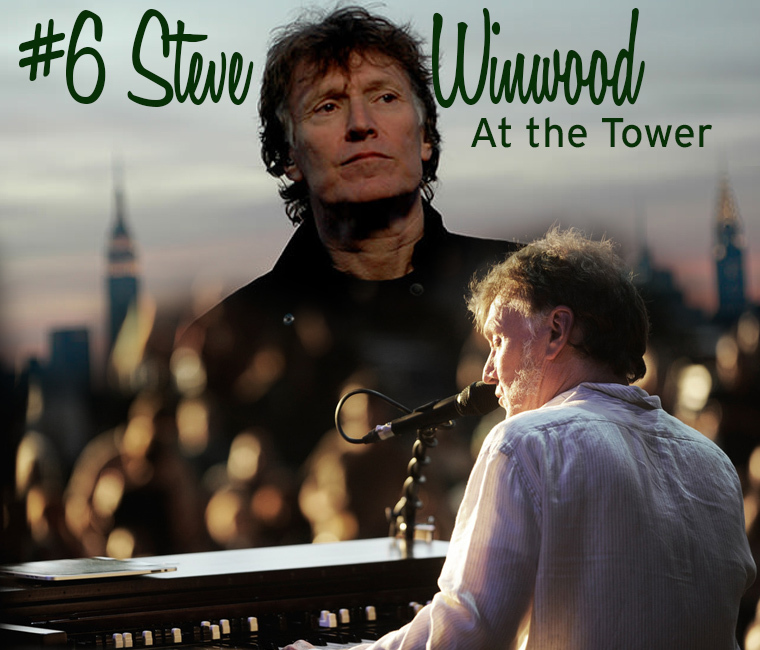 Winwood's solo hits include “Back In The High Life,” “When You See A Chance,” “Valerie,” and “Higher Love”. His most recent solo album, About Time, earned Winwood one of his highest Billboard chart entries. Winwood is in high demand for special collaborations with other artists. 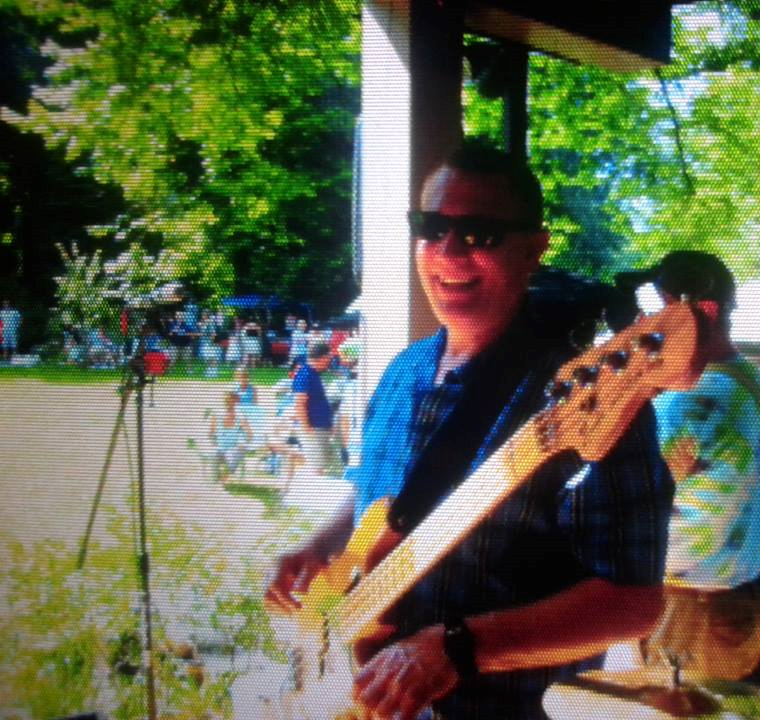 His distinctive Hammond organ has graced such classic fare as Jimi’s Hendrix’s “Voodoo Chile” as well as Miranda Lambert’s recent chart hit “Baggage Claim”. 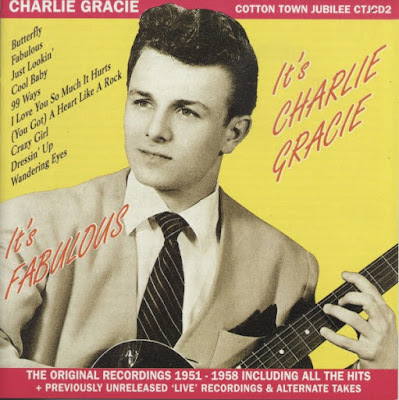 He is a recipient of the Ivor Novello Outstanding Song Collection and the Musicians Union Classic Rock Award—honors both voted for by his peers. And on June 5th, he will be inducted into the Walk Of Fame in Nashville, TN. He remains one of the most important and influential artists in all of popular music. 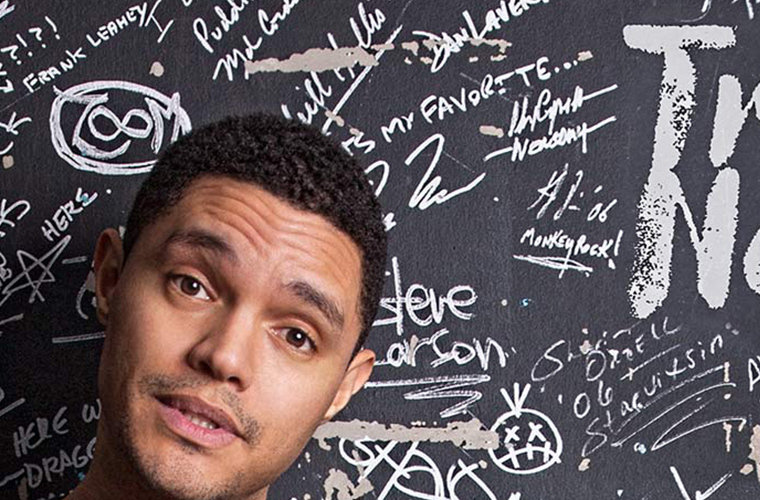 Funny Man Trevor Noah plays the Tower on April 7th. He is a South African comedian, writer, producer, actor, media critic, and television host, including host of The Daily Show, a late-night talk show on Comedy Central, since September 28, 2015. 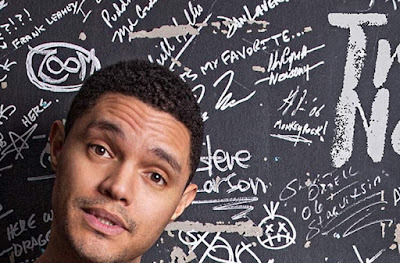 Trevor has hosted numerous television shows in his native country, including South Africa’s music, television and film awards, the South African Comedy Festival and two seasons of his own late night talk show. He had his U.S. television debut on “The Tonight Show with Jay Leno” and has also appeared on “Late Show with David Letterman,” becoming the first South African stand-up comedian to appear on either late night show. There's something about having to 'hunt' for candy that makes it taste just a little bit sweeter...so leave the phones and ipads at home and take your children on an Easter Egg Hunt adventure! · Photos with Mr. & Mrs. Bunny! · Entertainment including balloon twisters, caricatures, and face painting! The cost will be $10 per family (For children 10 and under). All proceeds will go to Alex’s Lemonade Stand. *Raindate will be April 15. This event will take place at the Conservatory. Bring your 'little bunnies' to Thornbury Park for their annual egg hunt -- and BE SURE TO BRING A HOME MADE DECORATED EGG for a chance to the win 'Best Decorated' contest! Light refreshments will be served. 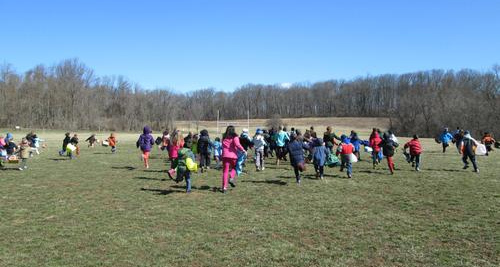 Follow the crowd at the Thornbury Township Easter Egg Hunt! 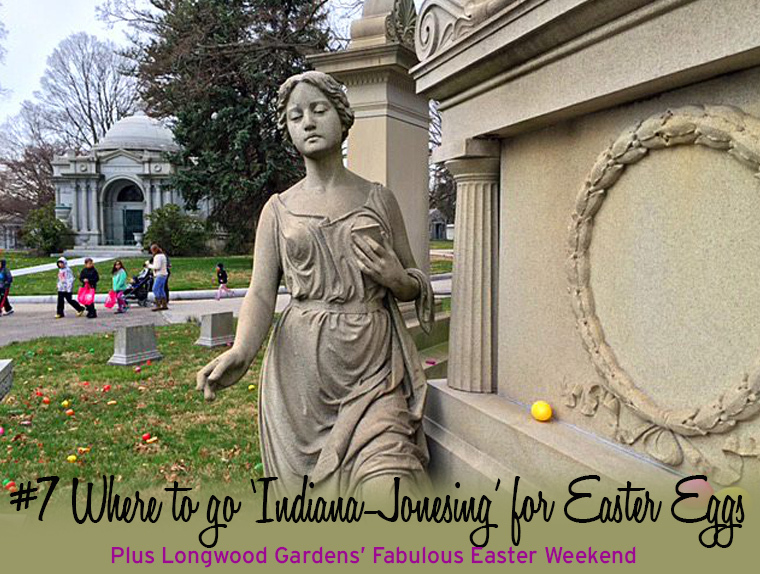 This historic site is a very cool place for an Easter Egg Hunt. There are lots of hidey-holes, corners and nooks for hiding eggs, so bring the little ones and watch them scour the farm for Easter Treats. Adults $10 -- Children $6, and children under 4 are free. 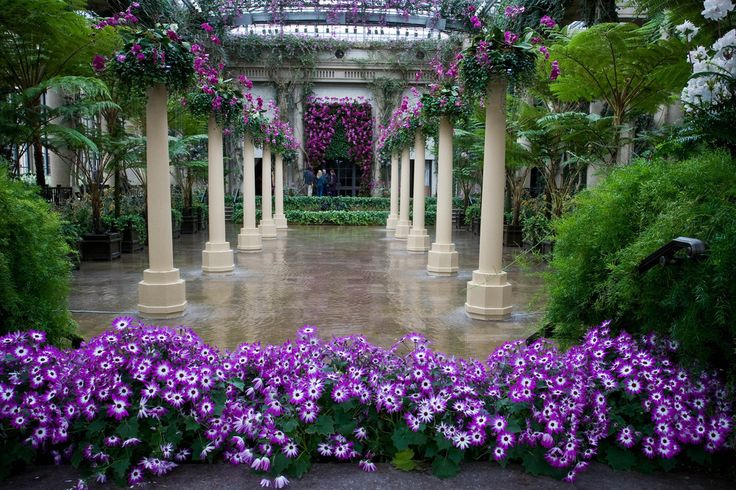 On April 15th and 16th Longwood Gardens presents an amazing weekend of gorgeous blooms, outstanding food, live music and more! 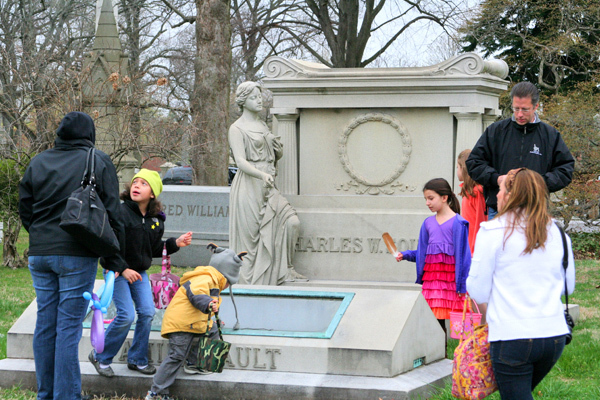 Their Easter Brunch will sell out quickly, so make reservation ASAP. Café will be available from 10:00 am–5:00 pm and features a special menu of lamb, salmon, pasta, soups, and salads. Easter reservations are available for a fine dining experience at 1906 from 10:00 am–4:00 pm both Saturday and Sunday with a menu featuring lamb ragout and smoked duck quiche. Additionally a wine and champagne bar will be available at the Terrace Restaurant. Buy early. Tickets limited. Sellout likely. 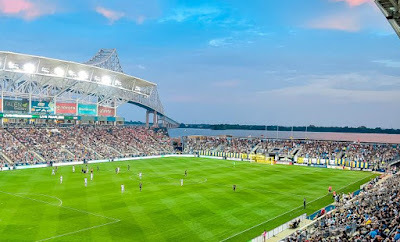 You know it's spring when the lights flip on at Talen Energy Stadium and our Philadelphia Union Soccer Team takes the field! There's a buzz (and lots of Doop!) in the air...not to mention an awesome view of the Delaware River. April kicks off with an away-game as the Union travel to take on D.C. United, Saturday, April 1st at 7pm. Buy everything from Single Tickets to Partial Plans, Season Tickets or "Doop" Your Group Tickets! 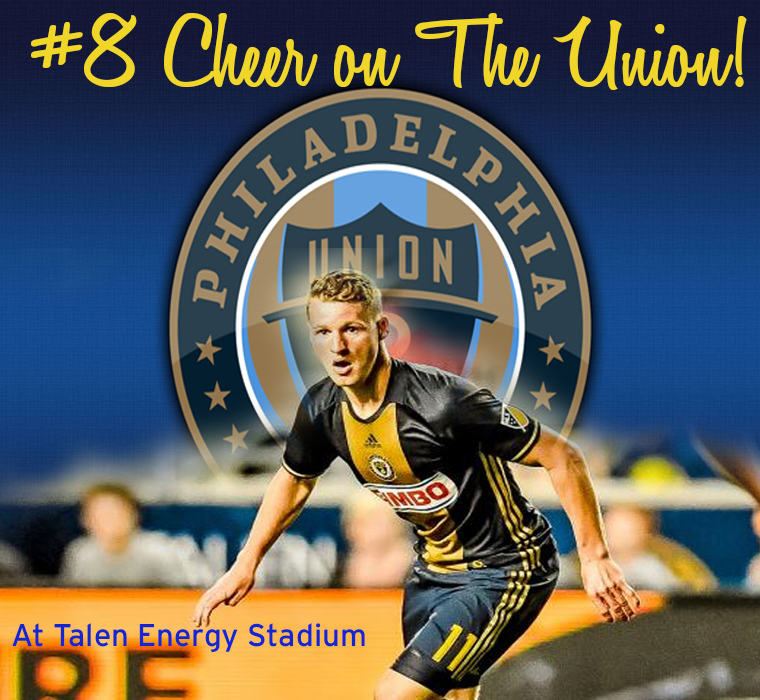 And for the first time, the Union will also be offering a Fully Flex 9 Game Plan where fans can select their games along with a Tiered Flex 5 Game plan. Fans can purchase or find out more info at Click for Union Tickets or by calling 1-877-21-UNION. The Union will host their first Youth Soccer Night on April 8th when Philadelphia faces off against the Portland Timbers. There will be family friendly activities before, during, and after the game. Before the game, fans compete in games out on Toyota Plaza. A juggling contest, where one boy and girl aged 14 and under will win a post-game autograph session with the Union. 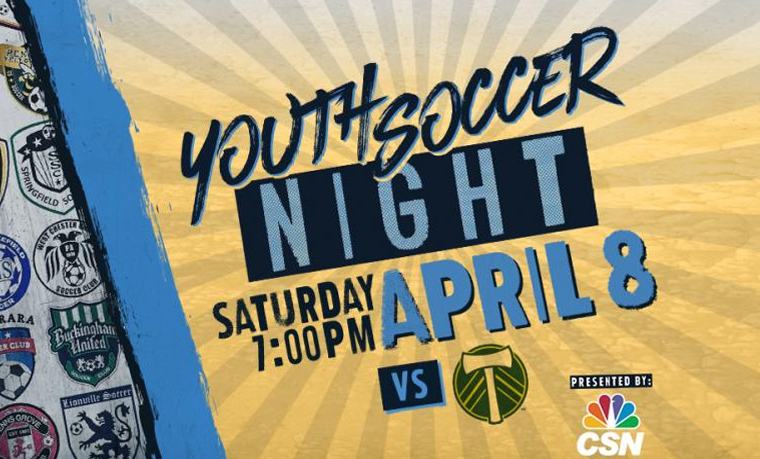 Select youth teams will play mini soccer games during halftime. 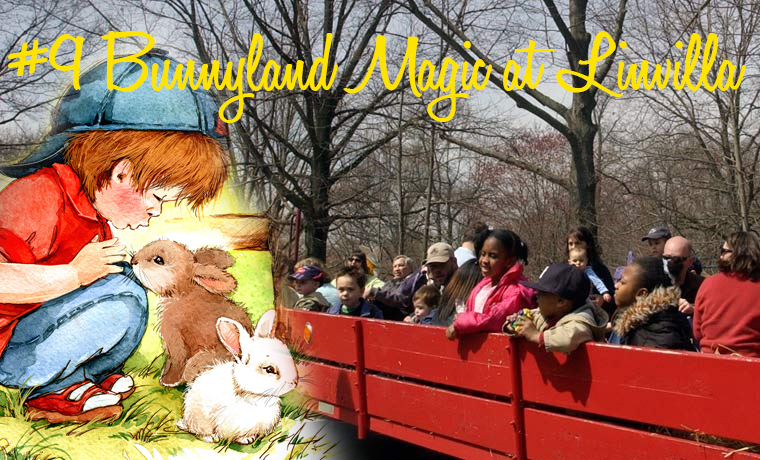 There’s no place quite like Bunnyland at Linvilla Orchards. From cute baby animals to hayrides, train rides and homemade Easter treats -- there's something for every family member to love. 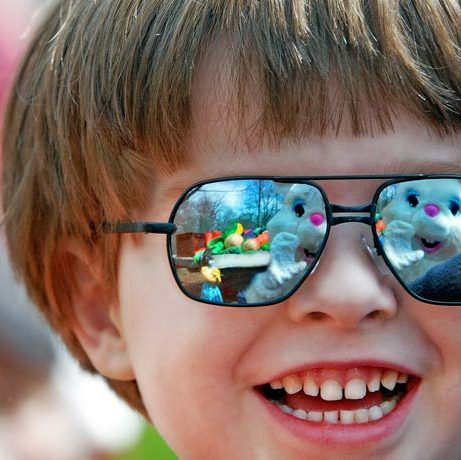 So hop on over to Bunnyland and let your inner kid go Easter crazy. 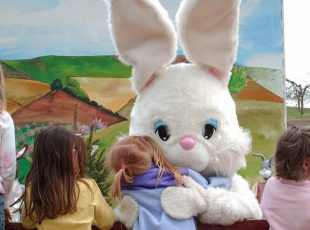 The Hayride to Bunnyland carries you through the woods to visit the Easter Bunny’s house where you'll meet Linvilla's resident Bunny! Be sure to bring your camera since the Easter "B" likes to take pictures and give special treats to every visitor. The Linvilla Orchards Playland Express chugs around a 1-acre track near the Playland Playground. Choo-choose your seat and get ready to ride! The Farm Market has all homemade Caramel and Candy Apples, traditional chocolates, old-fashioned candy and delectable truffles- you will most certainly be able to find something that satisfies your sweet tooth! eyes. There will also be 2 new calves. Winter turned into spring a few weeks ago...and the Community Arts Center in Wallingford invites you to celebrate with an Island Party and Fundraiser on Saturday, April 22nd from 7 to 10pm in the Duke Gallery. mento and calypso with American jazz and rhythm and blues. 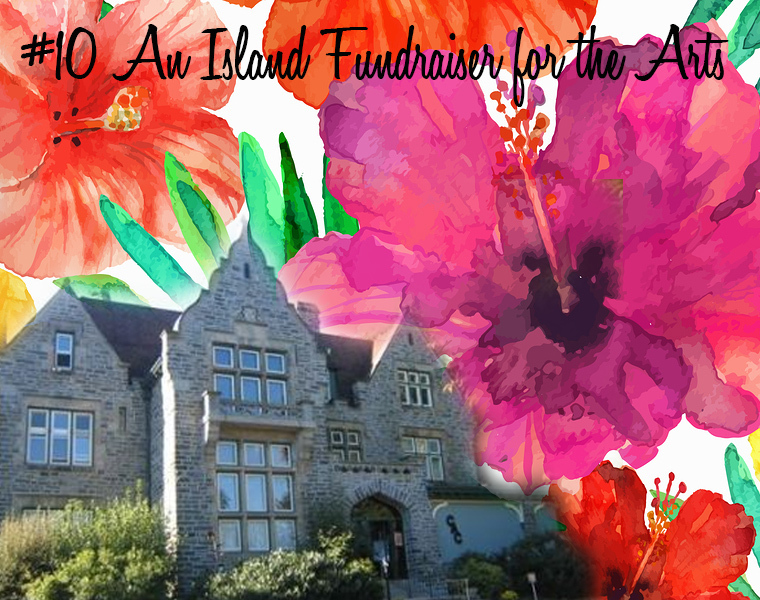 Dress in your most creative and colorful Island best for a tropical evening that helps fund the arts in Delaware County! Tickets: $55 Available online, in person or by phone. They encourage ticket purchases at least 2 weeks in advance. 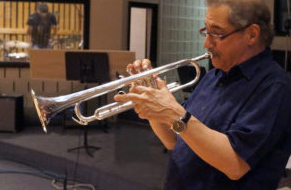 April 28, Musical Artists: John Vanore & Abstract Truth, contemporary large ensemble jazz band. The Friday Night Live concerts are BYOB and BAYF (bring all your friends). Light refreshments will be offered, but you are welcome to supply your own snacks as well. Performances are 7pm to 10pm, and tickets can be purchased at the door.